If you’re looking for a durable juicer that can make fresh juice out of fruits, vegetables and other leafy greens that you feed it, we recommend that you take a look at the Breville JE98XL Juice Fountain Plus 850-Watt Juice Extractor. The Breville JE98XL is a dual speed centrifugal juicer that runs on 850 watts of power. The dual speed motor allows you to extract the maximum number of nutrients possible from fruits and vegetables that you feed in at different speed levels. Hard fruits usually require a faster RPM whereas soft fruits and vegetables require a slower RPM. The Breville JE98XL comes with two speed controls – 12,000 RPMs and 6500 RPMs. Let’s begin this Breville JE98XL Juice Fountain Plus Review with it’s amazing features. – The Breville JE98XL uses a dual speed 850 watt motor. The reason Breville uses a dual speed motor with the JE98XL is mainly to ensure efficient juicing with all kinds of fruits and vegetables. Harder fruits and vegetables like apples and beets require a higher RPM to ensure maximum extraction of juice whereas softer fruits and leafy green vegetables require a lower RPM to ensure maximum extraction of fruits. The speed of the Breville JE98XL can be controlled and alternated between 6500 RPMs and 12,000 RPMs depending on the type of fruit/vegetable you are juicing. – The Breville JE98XL features a NutriDisc with stainless steel blades and a stainless steel mesh filter basket for spinning out the pulp. The stainless steel blades ensure more efficient juicing even on the hardest of fruits (such as pineapple). The blades stay long sharper even if you juice hard fruits almost daily. 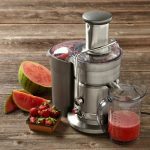 – The Breville JE98XL also features a wide 3 inch feeder chute (which is larger than traditional juicers) that allows you to put in fruits and vegetables in large chunks without having to chop them down. You can easily feed whole apples, tomatoes and peeled oranges without having to chop them down. 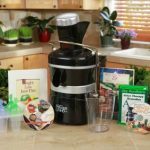 – Cleaning is extremely easy with the juicer. Most of the parts in the Breville JE98XL Juice Fountain Plus can be rinsed clean in the dishwasher. Some of its parts require a brushing action and hence require you to clean them by hand. 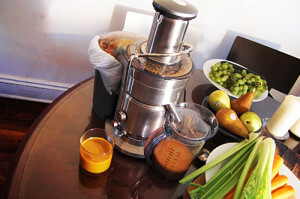 But certainly it’s a lot easier than other juicers. 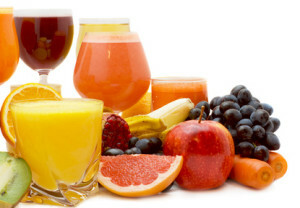 – One of the things that make the juicer stand out from other juicers in the market is its speed. Not everyone has the patience to wait for thirty minutes for a juicer to completely work through the vegetables and fruits (which is the case with masticating juicers). Juicing takes less than a couple of minutes with the Breville JE98XL even if you feed large chunks of fruits and vegetables. You can expect your juice to be ready in under a minute or two with the juicer. – The problem with juicers that have a large chute is that you have no way of telling if the unit is overloaded. Complications can arise if the machine is made to run on overload. The Breville JE98Xl features an overload sensor that prevents overheating and automatically shuts the machine down when it’s overloaded. 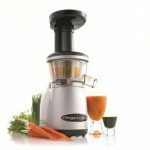 – The Breville JE98XL isn’t an ideal juicer for juicing soft vegetables and leafy greens. Leafy greens such as spinach cannot be juiced on the Breville JE98XL. 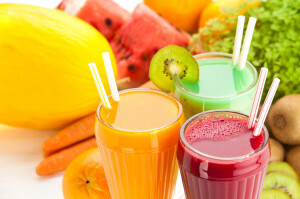 The juicer is only perfect for hard fruits and vegetables. 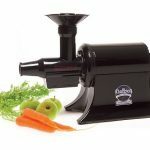 If you’d like a juicer that can juice leafy greens, we recommend purchasing a masticating type juicer. 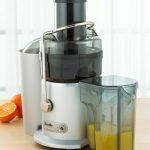 – When compared to masticating juicers, the juice output of the Breville JE98XL is considerably less. But it saves you a lot of time and money. The upfront cost of purchasing a masticating juicer is a lot more and it takes a lot more time for these juicers. The Breville JE98XL Juice Fountain Plus is an ideal juicer if you’re into juicing fruits and vegetables. It’s efficient and ensures maximum amount of juice is extracted while maintaining and protecting healthy enzymes. But if you’re looking to juice leafy greens, this isn’t the juicer for you.